Huzzah and hooray Patrice! Well and darn well said. Would the category "murder by gun" include deaths through accidental discharge, manslaughter etc.? Where I come from, "murder" is a narrow category of crime. Don't let your politics get in the way of facts. Figures from the arguably liberal gunpolicy.org show about 33k gun deaths in 2016. Of those, the numbers also reflect legal gun deaths (police intervention), and suicide. Even notoriously liberal snopes.com doesn't dispute these numbers. go to 'gorgesgrouse' at blogspot for a meme posted several days ago which unearths who 'snopes' is. I decided a few years ago that I could not argue 2nd amendment with liberals. They ignore all facts, statists, logic ETC because they are driven by feelings not facts. We had a friend come to the farm and stay overnight. She asked that I put away my guns so that her children would be safe. I did except for the one in my pocket so I was sure her children would be safe. Of course you may want to mention that if his/her children are so immature and poorly mannered they run amuck as guests in the homes of others that perhaps everything should be "child proofed" regardless of the age/ages of said children. All medications of any sort should be stored some where locked up, all knives, scissors, screwdrivers and sharp objects of any sort should be locked away. Child guard outlet covers should be employed, keys to all vehicles and atvs, boats etc. Should be out of reach as well as all cleaning chemicals. Ofter all the little darlings can't be disciplined or mom or dad may be triggered, have a meltdown and need their safe space. Better yet - just uninvited them so you and yours can ENJOY your holiday dinner. As I sit here trying to make the decision to comment on the item at the top of the list and the fallout that will ensue ie abortion. I must remind everyone weather you are for or against abortion that the rates have will not decrease. But the fall out of back street and illegal abortion with increased deaths and infections. So you may even see this death rate increase. LOL! When my ill-behaved step-grand kids come over, I just let their parents know that there are loaded guns in our master bedroom and close the door. Helps keep the parents on their toes instead of ignoring the little tyrants. I don't care HOW anti-gun you are. If you refuse to teach your children to use them responsibly, AT LEAST teach them to leave them alone. Ignorance IS NOT a virtue, no matter who told you it is. "Ignorance is a self-inflicted misfortune." I do not know who to credit, but the statement really says it all...! 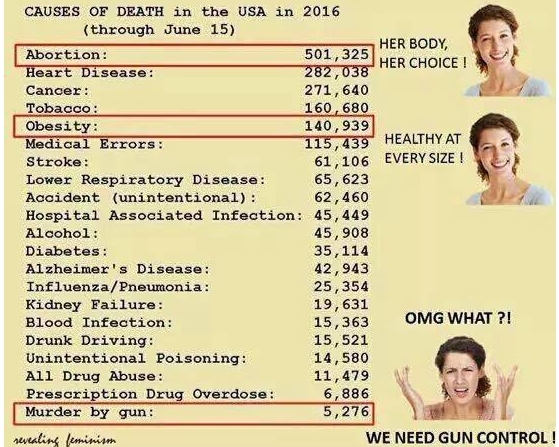 My doctor is more than 100 times more likely to kill me than my neighbor with his gun. Hmm... which should I give up?